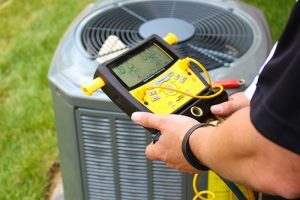 Is your air conditioner failing to keep your home cool? Usually, you will first notice that your AC is running constantly but not getting down to the temperature you’ve set on your thermostat. When you go outside and check the outdoor unit, you find ice, which seems odd on a hot summer day. It is odd, and it means that your air conditioner is not working properly. It’s time to call for AC repair in Greensboro. Dirty filters. If your filters are clogged with dust, then the proper amount of air isn’t getting through. Without proper airflow over the evaporator coil, your system may actually get too cold and freeze up. Check your filters first and replace them if they are dirty. Then see if airflow increases. If so, that was likely the problem and your system may thaw out on its own. But keep a vigilant watch for the next few days for any other signs of damage. Low refrigerant. When the refrigerant level in the coil is low, it can cause ice to form because it isn’t able to absorb enough heat. Low refrigerant is typically due to a leak which will need to be repaired by your local HVAC technician. Blocked drainage tube. Air conditioners generate moisture that needs to be drained through a tube. When that tube becomes blocked, the extra moisture in the system can cause ice to form. Call your HVAC service to check your drainage tube and remove the blockage. Broken thermostat. It’s possible that your thermostat is not working properly. If the thermostat is not able to accurately measure the indoor temperature, it could cause your system to run double time and possibly freeze over. Berico can test your thermostat and either repair it or replace it. Faulty fan. If the fan is broken or not blowing with enough force, it causes the same airflow problem that dirty filters do. When airflow is low, the system can freeze up. Ice on your AC unit is never normal on a hot summer day. It’s always best to have a professional HVAC technician take a look at your system when something isn’t right. Even if you change your filters or unblock your own drainage tube, both are an indication that it has been too long since you’ve had professional maintenance. Regular tune-ups will keep your system running efficiently and help you avoid unexpected AC problems. Filter replacement, drainage system maintenance, and a long list of other checks and balances should be performed yearly as part of routine AC repair in Greensboro. Not only will you save money on energy bills, but you’ll avoid expensive repairs and emergency or after hours fees. If your air conditioner is frozen over or if it’s been a while since your HVAC system has been tuned up, call Berico at (336) 313-0466.